Wherever you are, be sure to take along at least one of our eye-catching Mirage Tunics with 3/4 sleeves and a longer hemline. The back measures about 3 inches longer than the front body length measurement. They have buttons down the front. Subtle colors in distinctive and popular cotton mirage, it will be the perfect cool top for your tropical vacation this winter. Very generous sizing, S, M, L, XL. See size details in Size Selections. Falls well below hip length. 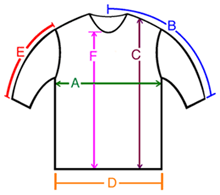 A: Chest / Bust circumference 42-43" 43-44" 47-48" 52-53" 54-55" 59-60"
B: Sleeve length center neck to end of rolled sleeve 21.5" 22" 23" 24" 25" 25.5"
C: Body length from shoulder to bottom of hem 31" 31" 31.5" 31.5" 32" 33"
D: Hem circumference 46" 48" 54" 58" 60" 65"
E: Sleeve length from shoulder to end of sleeve 14" 14" 14" 14.5" 14.5" 14.5"